Every now and then, I'll reach out to the Good Financial Cents community for their input regarding what they'd like to see on the blog. One person said their biggest financial fear wasn't generating enough income to maintain their current plan. I thought I'd address that fear in this post. After all, that's pretty scary, right? Imagine not bringing in enough income to pay your bills or those unexpected expenses that come up every so often. Perhaps you don't have to imagine that scenario -- you're living it! You know exactly what it's like to be late on your bills and have to borrow using credit cards to make ends meet. Whether you're in that scenario or you want to know what to do should you find yourself there, this post is for you. The Financial Blogger's Conference community provided me with some of their best tips that I'll incorporate into this article. You'll love what they have to say. One important thing is to not be hard on yourself. It doesn't usually help anything, and the truth is that most everyone falls short of their expectations sometimes. Once you have taken a few deep breaths, walked around the block and made a mental list of all that is good in your life, you will have the mental clarity to make some new decisions. So sit back, don't sweat it and let's figure out what to do when you don't make enough money to fund your budget. It's All About Income ... or Expenses ... or Both! When you don't make enough money to fund your budget, there are two areas that often need to be analyzed: your income and expenses. Simple, right? What's simpler is if you have a million dollars -- or some other large amount of money -- sitting in your closet that you forgot about. You really only have two choices: make more money or spend less. The first thing you should do is figure out if you have an income problem or a spending problem. If you're only spending on basic essentials and you still don't have enough money to get by, work on finding higher paying work or more hours of work. If you're spending on cell phones, cable TV, and vacations, you may have a spending problem and should work on cutting nonessential expenses until your budget balances or until you can earn more income to cover those luxuries. Evaluate the issue (earning potential or excessive expenses) and create a plan of attack (reduce commuting/housing costs, look for a new job, relocate). It's also important to keep in mind that there will be seasons of feeling or being poor in order to obtain that next goal or milestone (school, graduate school, new job, launching of a new company, etc.). When you've realized you don't make enough money to fund your budget, you need to make a tough decision. Earn more money by asking for a raise, adding a side hustle, or changing careers -- or trimming the excess expenses, paying off debt, and living on less. What's most important? Making sure the choice is sustainable for you and your family. Make more money! It sounds so common sense, but when you're in the moment and struggling with not having enough, there's a tendency to put so much focus on the lack, that the very practical solution of tackling the other side of the equation -- generating more cashflow -- often gets overlooked. What's one important thing you should do when you don't make enough money to fund your budget? I would audit my expenses -- cut back on what I can or get rid of what I don't need. You really need to prioritize the spending items you value most. Is an extra $100 eating out more or less valuable than the $100 you want to save for some future purchase or $100 you want to give to your church or charity? It needs to be focused around your values, otherwise a change in spending habits is hard to stick with. In regards to the idea of "make more money," I find this a complete fallacy. Why? Because oftentimes, as soon as you make more, you find more things to spend it on and you end up in the same predicament. Hence, stick with values spending. One important thing a person would do when they don't make enough money to fund their budget is to find ways to cut their budget. Whether that means cutting something completely out (such as a gym membership), negotiating for a lower rate, or cutting back in an area, something needs to be done so that you can stop living paycheck to paycheck. Get very critical about which budget items are truly "needs" and truly "wants." Start by cutting back on the "wants." Write out a budget in order of priority (#1 shelter, #2 food, #3 utilities, etc.). Fund each item in order using your income. When the money is gone, draw a hard line. Anything below the line does not get funded. Done. Part two of this is to research hundreds of ways to make extra money now!Jay Monee's side hustle series is a great place to start. [What do you do] when you don't make enough money to fund your budget? Fix your budget. Get rid of cable TV, change phone plans, sell your car, move to a cheaper place, stop eating out. Cut your grocery budget. It's the easiest place to "find" extra money and depending on what you're spending now, that can free up several hundred dollars. If you eat at home and pack your lunches for work, that can buy you some time to figure out other solutions. Cut the "fat" and rein in the impulse spending. Most people think they don't have enough to fund their budget because their budget is funding lifestyle inflation and "wants." People don't focus much on needs anymore due to our consumer culture. Get really honest with yourself, learn to track every penny, and make changes. If all else fails, get a second job and make more money! Whether you have an income issue, expense issue, or both, there are some tactics you can use to reach your goals. Let's take a look. Find an accountability partner or group. Find someone you respect and that is fiscally responsible to talk with about your challenges. 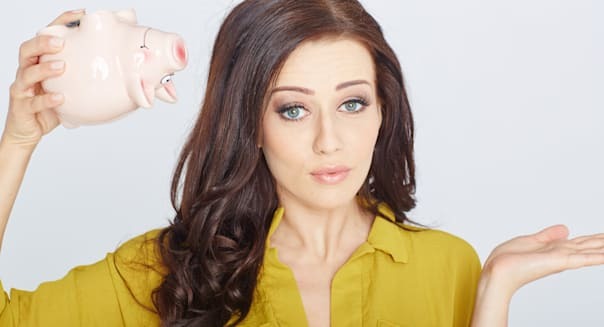 Often, an objective, unbiased perspective can help sort through issues to determine if you have a spending problem or making more income is really the best solution. An accountability partner will apply positive peer pressure so you can stick to the goals you've outlined. Keep a positive mindset and recognize this as a temporary situation. If you get used to spending more than you make, you might never get out. When you find yourself with more budget than income the first thing you have to do is resist panicking! Panic creates opportunities to make bad decisions. Take a walk outside, clear your head, and with a clear mind look at your overall situation. You'll make better decisions by managing your emotions. When you spending exceeds your budget, the single most important thing you need to do is acknowledge this can't go on forever. Something needs to change. Change might mean reevaluating your budget by giving up a "luxury" such as a coffee or eating out. Other change could be asking for a raise or getting a second job. Once you accept the need for change, you can begin to correct the problem. Take a deep breath and remember why you started a budget in the first place. Whether it was to get or stay out of debt, save for retirement, or put money toward a beach getaway, tap into that motivation and ask yourself, "Is [budgeted expense] more important than my goal?" If you're truly motivated, you'll find or make ways to cut back and/or earn more money. In order to want to do something, you have to be genuinely motivated. If you don't have a reason to accomplish your goals, you're not going to achieve them. As you can see, there are a bunch of suggestions regarding what to do when you don't make enough money to fund your budget. Some feel cutting expenses is the most important part of the equation, and others feel that raising income is the best way to go. Others advocate both approaches. So what should you do if you're having this financial problem? Well, that depends on your individual scenario. I would advise you to target the area (income or expenses) that will make the most difference in your life, and then move on to the other one. If you need to focus raising your income, I have a whole bunch of home-based business ideas in this article: 65 Home Business Ideas You Can Do From Your Kitchen Table. If you need to focus on cutting your expenses, check out 70 Super Easy and Practical Ways to Save Money. Need to make money fast? Check out 100 Ways to Make $100 Fast. Whatever you do, don't make yourself overwhelmed. Pick a couple of things to try out, see how they work for you, and move on to the next ideas once you've exhausted your first ones. Stay motivated, and one morning you'll wake up and discover you have enough money to pay your bills. That's a dream worthy of pursuit! If you're not going through this financial problem right now, make sure to keep your expenses low and income high. You might be able to avoid having this problem in the future, and you should always try. You're doing great and I encourage you to continue to do so. How would you or are you dealing with this situation? Leave a comment.